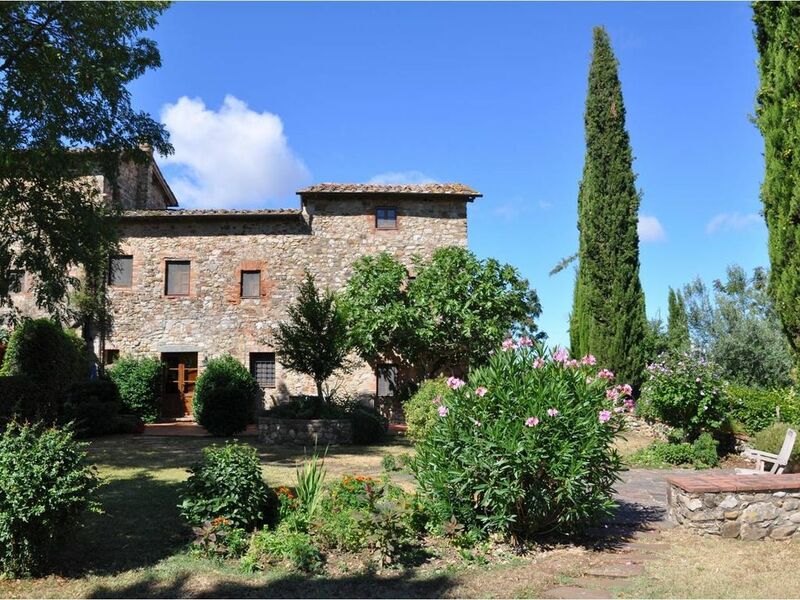 Beautiful home in Tuscany where you can enjoy the romance and tastes of Italy's wine country. Centrally located in Tuscany's wine country and high on a hilltop where you can share the magnificent vista of endless grape and olive vineyards. Period Italian furnishings give a sense of times past. Easy access to Pisa, Florence, Siena and many, many smaller, quaint Tuscan communities. Rome only about a 3 hour drive away. If renting a car, suggest renting a 4-wheel vehicle as the gravel road up to Le Bagnaie from the main highway can washout a bit with rain. We literally have adored this place and the house was very comfortable, well equipped, and simply warm and welcoming. The views around Le Bagnaie are exceptionally beautiful and filled us with joy and peaceful emotions at every moment of the day: When opening the shutters in the morning, when going to the vegetable garden for picking up some delicious tomatoes or eggplants for our lunch, when at the pool in the afternoon or early evening, when looking at the sunset in the direction of San Giminiano and looking up at the shooting stars at night! We enjoyed many going-outs, to Siena, San Giminiano, Volterra, Colle di Val D’Elsa and, as a crowning point, to Panzano to the very special butcher’s restaurant. We especially enjoyed the garden of Casa del Fico, a little paradise which invited to long hours of reading on the lounging chairs. We also had many walks in the immediate vicinity of the house, up to Fonterutoli, sparkled with encounters with deers and boars. Jackie, Serena and Cosimo were all real treats. Jackie the manager made feel very much “at home”, Serena, the cook prepared us feasts and Cosimo, the gardener, is delightful and charming and deserves the awards of the “ green palms”! We will come back even though we live so far away, with our sons and grand-children hopefully next times. Our guests ( friends and family) join us in celebrating the “ravissement” and we will all keep fond memories of these two weeks! Agreable maison, faisant partie d' un ensemble de 6 maisons, bien restaurées, sur une colline avec vue imprenable à 360 degrés. A beautiful location, stunning views, helpful people- we didn’t want to leave! The house was well equipped and the grounds beautifully maintained. The pool and tennis court were fabulous and views amazing. The unit shares a large property with six other units. But, it is set up so that you are not aware that anyone else is there. (But, we did spend some pleasant time with our "neighbors".) It sits up on a hill top with stunning views. Not right in town but still conveniently located. The unit is very spacious, very comfortable and well-equipped. We had everything we needed. Would definitely stay again. Final cleaning is included plus 3 additional hours for 2 week lets. Includes all linen and towels (not swimming towels).